Tools used in VR content creation help in the creation of virtual assets such as applications and cinematic views. The advent of VR tools is therefore considered a major breakthrough, which enabled people present 3D ideas and design more efficiently than ever. VR content creation tools can put targeted audience into the world of virtual entertainment, which is idea behind designing more interesting and interactive contents. VR content creation includes the development of sketch, pre-production activities, shoot, and post-production. In order to create virtual reality content, enterprises engaged in VR content creation use advance software and cameras. Driven by these factors, the global VR content creation market is forecast to witness strong growth in the coming years. According to Transparency Market Research (TMR), the global VR content creation market is likely to exhibit a CAGR of 89.8% between 2016 and 2024. At this pace, the market is expected to reach a whopping US$41.01 bn by the end of 2024 from a valuation of US$147.5 mn in 2015. Regionally, North America emerged dominant in the global VR content creation market with a share of 73.4% in 2016. The prevalent gaming culture in the region, especially in the U.S., and the rising adoption of novel technologies such as virtual reality have aided the expansion of the VR content creation market in North America. As consumers are more interested towards immersive experience they are receiving through the integration of virtual reality, the demand for VR content creation is forecast to increase further in the region. However, over the course of the forecast period Asia Pacific is forecast to exhibit higher growth. TMR has projected the region to exhibit an exponential CAGR of 116.1% between 2016 and 2024. This regional market will gain from the rising awareness about virtual reality in the region and the entry of new players. The global VR content creation market can be segmented based on content type, end use, and solution. Among the end users constituting travel, hospitality, and event, real estate, media and entertainment, retail, gaming, and automotive sectors, the gaming industry is exhibiting the most lucrative opportunities. This industry therefore enjoyed lead in the overall market in 2015. In addition, the recent technological advancements are expected to seal the dominance of the gaming sector in the overall market. During the next few years, the use of VR content creation is also likely to increase across media and entertainment, and travel, hospitality, and event sectors. Moreover, the automotive industry is forecast to showcase attractive opportunities. The market is expected to gain traction as the adoption of immersive and 360 degree videos increase in the retail sector. Big retail brands are expected to use VR content creation to improve the overall consumer experience. Spurred by these factors the global VR content creation market is expected to report strong growth in the coming years. Some of the companies to benefit from the aforementioned trends are Koncept VR, VOXELUS, SubVRsive, Panedia Pty Ltd., WEMAKEVR, 360 Labs, MATTERVR and Elysian Studio Private Limited (Meraki). VR content creation market report provides analysis for the period 2014 – 2024, wherein the period from 2016 to 2024 is the forecast and 2015 is the base year. The report covers all the major trends and technologies playing influential role in the VR content creation market’s growth over the forecast period. It also highlights the drivers, restraints, and opportunities expected to impact market’s growth during the said period. 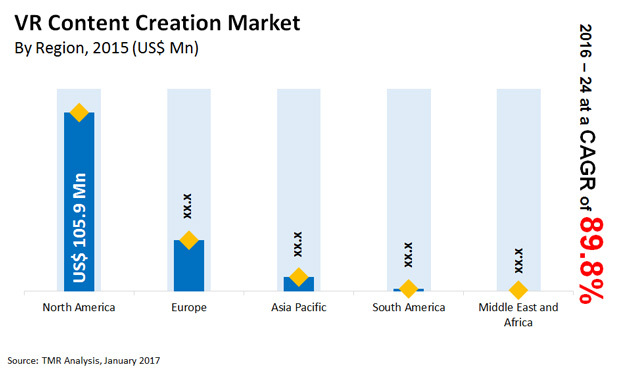 The study provides a complete perspective on global VR content creation market’s evolution throughout the above mentioned forecast period in terms of revenue (in US$ Mn). This report provides all the essential information required to understand the key developments in the VR content creation market, growth trend of each segment and companies’ strategies to efficiently compete in the market. Also, the report provides insights related to trends and its impact on the market. Furthermore, Porter’s Five Forces analysis explains the factors which are currently affecting the VR content creation market. The market overview section of the report demonstrates the market dynamics such as the drivers, restraints, and opportunities that influence the current nature and future status of this market, key indicators and trends. An attractiveness analysis has also been provided for every segment in the report, in order to give a thorough understanding of the overall scenario for VR content creation market. Moreover, the report provides an overview of the various strategies adopted by key players present in the market. Key market indicators included in the report provide significance of the factors which are capable of changing the market scenario. These indicators are expected to define the market position during the forecast period. The report also highlights the competitive landscape of the global VR content creation market, thereby positioning all the major players according to their presence in the different regions of the world and recent key developments initiated by them in VR content creation market. The comprehensive VR content creation market estimates are the result of our in-depth secondary research, primary interviews, and in-house expert panel reviews. These market estimates have been analyzed by taking into account the impact of different political, social, economic, technological, and legal factors along with the current market dynamics affecting the Americas data center market growth. The report segments the market on the basis of solution basis of content type, solution, and end-use sector. The content type segment include videos, 360 Degree Photos and games. The video segment is further sub-segmented into 360 Degree and immersive videos. On the basis of solution, the market is segmented into software/application and services. The end use sector considered in the market include real-estate, travel, hospitality and events, media and entertainment, retail, gaming, automotive and others. The report provides in-depth segment analysis of the global VR content creation market, thereby providing valuable insights at the macro as well as micro levels. Koncept VR, VOXELUS., SubVRsive, Panedia Pty Ltd., WEMAKEVR, 360 Labs, MATTERVR and Elysian Studio Private Limited (Meraki), Matterport, Wevr, Vizor, and Blippar are some of the major players operating within the VR content creation market profiled in this study. Details such as financials, SWOT analysis, business strategies, recent developments, and other such strategic information pertaining to these players has been duly provided as part of company profiling.